A new development along the Jourdan River will conserve nearly 60% of the 183-acre site as open space, including native marshes and forests. 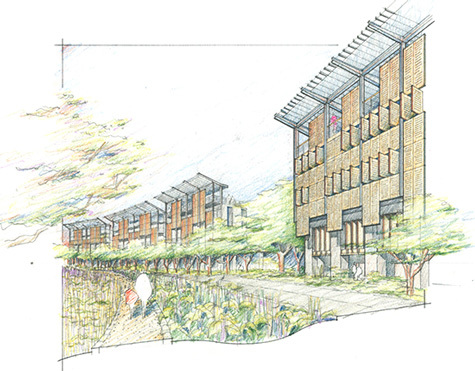 The compact, walkable neighborhood will have sidewalks at street edges, trails at the marsh edge and a promenade along the waterfront. 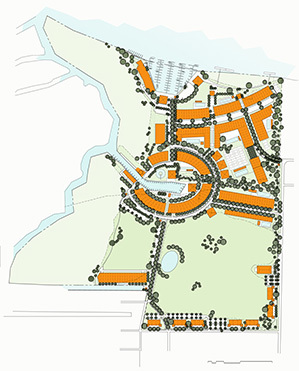 The master plan illustrates a diversity of uses including a marina and boat store, diverse housing options, live/work commercial, restaurants, lounges, an outdoor stage, and neighborhood commercial. Existing canals allow construction of boat slips and 14 boathouses at the lagoon, and are joined by the Jourdan River Marina, providing a total of 283 new slips, ranging from 20’ to 120’ long. 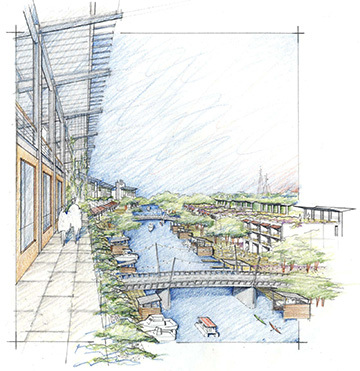 Stormwater innovations include the use of green roofs, bioswales to intercept runoff from roads, and an enlarged pond to become a community feature. Recreation includes putting greens, tennis courts, swimming pools, piers, and charter boat fishing.